A new report, “ELECTRONIC WASTE: Actions Needed to Provide Assurance That Used Federal Electronics Are Disposed of in an Environmentally Responsible Manner,” released yesterday from the Government Accountability Office (GAO) finds that federal agencies still have a long way to go in managing their own e-waste responsibly. Interestingly, problems identified in the report are ones that would be addressed by the passage of bi-partisan Congressional e-waste legislation introduced in the House and Senate, the Responsible Electronics Recycling Act. 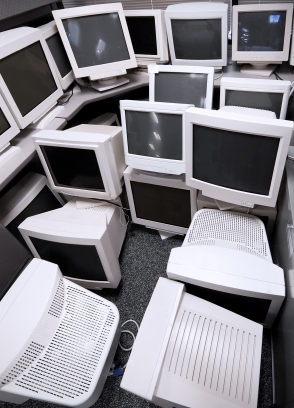 There have been several efforts by the federal government to promote better “stewardship” of used electronics including two executive orders plus voluntary efforts led by the EPA, the GSA, and an interagency task force. The GAO goal for this report was to review these efforts and see if they’ve been effective. For it’s study, the GAO looked at a cross section of five agencies. What it found is that while there has been some improvement in management of federal e-waste, none of these efforts can assure that federally owned e-waste is being managed responsibly, mostly because the agencies can’t show what’s ultimately happening to their used products. As long as they are selling e-waste via auctions, the agencies will be unable to control or even know what happens with their used products. Brokers commonly buy lots from auctions, and export them to developing countries. The report found that federal agencies don’t even see it as their responsibility for making sure their e-waste is disposed of properly. Not allow federally owned e-waste to be exported to developing countries. This includes units/parts that are not tested, or are not found to be fully functional. No auctions. There is no way to perform due diligence on equipment purchased at auction. This practice should be ended. Use certified e-Stewards. This is the strictest recycling standard out there, so the federal agencies should use recyclers certified to this standard. No prison labor. Many agencies use UNICOR, a federally-owned, prison labor recycler, for their used electronics. This undercuts recycling business, and has many health and safety problems for prison workers. Track donations, to make sure they are ultimately recycled responsibly. Donations to schools and non profits or government agencies should be tracked, and the donating agency should make sure that this equipment (which often has a short reuse life) will be handled responsibly, even if the agency must provide the resources to do so. Fortunately, members of both houses of Congress have introduced a bill that would address these problems. H.R. 2284 and S. 1270, the Responsible Electronics Recycling Act (RERA) would restrict the export of toxic e-waste (including that coming from the federal government) to developing countries. This includes used electronics which have not been tested, or which are not fully functional. Exporters of electronics would need to be licensed by the EPA, which would weed out most of the brokers who currently buy at auction simply to export to developing nations.